The first thing you notice when you pick up the new Kindle Paperwhite is the lack of buttons. In fact there is just one and that’s for the power, all the other functions are performed via the touchscreen. For this model the grey coating of Kindle Touch is dropped in favor of a nice snazzy black finish. The back of the Kindle is made from one piece of soft rubber which has a nice feel and fits easily and comfortably into one hand. Along the bottom is the power button, charging LED and micro USB port for charging. Measuring 6.7 inches tall, 4.6 inches across and just 0.36 thick it is the smallest and thinnest Kindle ever and one of the most compact eReaders around. Weighing in at 7.5 ounces it is also slightly lighter than the previous Kindle. The Paperwhite uses capacitive technology this time instead of infra red which means that the screen sits flush to the bezel and makes it thinner than it’s predecessor. It’s the same size screen as most eReaders on the market today coming in at 6 inches. However this time around they have beefed up the resolution from 600 x 800 to 768 x 1024 meaning there are now 62% more pixels than before. The pixel density has also been increased to 213 making the text the crispest and sharpest yet. The contrast is also slightly improved. Now anyone who has tried reading on the previous Kindle or in fact any non lighted eReader will now how hard it is to see when the light is fading and impossible when there’s no light at all. The only way around this was to buy an add on light, but this wasn’t satisfactory at all as the light just shone from above onto the screen causing a lot of glare. Thankfully with the Paperwhite’s built in light this problem has been completely solved. Using several LEDs imbedded around the bezel it shines the light up from behind the screen to evenly illuminate the whole screen. It works very well and is a lot more subtle and easier on the eye than the way LCD screens light up the page. The brightness can be controlled by simply tapping near the top of the page, clicking on the lightbulb symbol and then dragging the slider up or down or turn it off completely. I found the light from the Paperwhite to be a little brighter than from The Nook Simple Touch with Glowlight and also to be whiter. As mentioned at the beginning of this review everything on the Paperwhite is controlled by the touchscreen. To turn pages forward you tap on the right of the screen and to turn back you tap on the smaller left zone of the touchscreen. You can also swipe left-to-right to go forward a page or swipe right-to-left to go back a page. Comparing with the Kindle Touch, page turns were noticeably faster on the Paperwhite. To bring up the main menu just tap at the top of the screen. That brings up the Home button, Back button, Lightbulb button, Shopping Cart, Search which allow you to search for a word or phrase across your Kindle Library, Wikipedia or the web and a button for Additional Features which allows you to change views, create collections, settings and the web browser. The shopping cart button takes you directly to Amazon where you can purchase and download books. If you are a Prime account holder you can also borrow books for free. When reading a book if you tap at the top of the text you get further options which allow you to change font types or sizes, line spacing, margins etc, a Go To option where you can select a word or a page number and a share option. The share option allows to directly post to your Twitter or Facebook accounts. You can also pinch in and out to change the font sizes. By tapping and holding onto a word, you get other options as well such as a dictionary and translations. You can also highlight part of the text to add a note to or share. The X-Ray function which carries over from the Kindle Touch and is an Amazon exclusive indexes the whole book and allows you to quickly get to any section of the book by selecting the terms, fictional characters, places and topics of interested that are listed. There is also a timeline of where each of the terms are listed. Another new feature is a reading progress meter in the bottom left hand corner which tells how long is left until you finish the chapter or book. Using the Whispersync technology means that your last page location is synchronized as well as your bookmarks and annotations across all your devices. The web browser is still called a “Experimental Browser”. You have the pinch to zoom function, but like most web browsers on eReaders the browsing experience is far from perfect and the refresh rate isn’t really up to the mark. Until the menu options you can select “Article Mode” which strips out the images and formats the text making it a much better viewing and surfing experience. Using Send to Kindle allows you to send documents, articles, blog posts and other web content to your Paperwhite. Just install the software from Amazon on your PC and Mac and you’re ready to go. If you want some diversion from reading there is an apps library of games and puzzles you can access, both free and paid. The main worry of the built in light was how this might effect the battery life. From usage I found the light didn’t really effect the battery life which was very similar to the Kindle Touch. Amazon themselves quote a battery life of 8 weeks for the Kindle Paperwhite, based on reading for 30 minutes a day, wireless switch off and light at roughly one third of its brightness. Like all eReaders turning off the Wi-Fi or 3G does a lot to extend the battery life. I also found that even with the ‘low power’ warning on i was still able to use the device for a few more days before the power ran out completely. Memory this time around has been halved to 2GB (1.25GB available for storage). That’s half of the Kindle Touch and indeed its predecessor the Kindle Keyboard, enough to hold up to 1,100 books. Saying that, it should be more than enough for most people and if however you do need more storage there is Amazon’s free cloud storage (5GB) where you can back up and store all your books and re-download when needed. As with previous Kindle models you get a choice of both 3G and Wi-Fi connectivity. The 3G option does cost £60, but unlike many devices such as the iPad, there’s no monthly fee for data. The big advantage of 3G is that you can download books on the go from anywhere there is 3G coverage. With the Wi-Fi only model you are limited to where there are Wi-Fi hotspots which you sometimes have to pay for. Another big advantage of the 3G Kindle used to be the fact that you could surf and download emails on 3G for free. However, last year Amazon restricted this access to Wi-Fi only. Basically this means that if you purchase the Paperwhite 3G, you can download books via the Amazon store and access Wikipedia via 3G, but all other websites will be over Wi-Fi only. Unless you travel a lot and want the freedom to download books wherever you are, I’d stick with the Wi-Fi version. 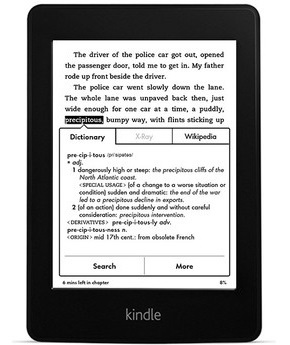 The Kindle Paperwhite as mentioned above comes in 2 versions: Paperwhite 3G (Free 3G & Wi-Fi) and Paperwhite which is Wi-Fi only. The 3G costs $179 (with special offers) and $199 (without special offers) and the Wi-Fi only version costs $119 (with special offers) and $139 (without special offers). The special offer versions feature adverts on the device. These are present when the eReader goes into sleep mode as a screensaver and they are also present along the bottom of the device when in menu mode. They are however absent when reading an actual book. I personally didn’t find them that intrusive and like I sais they aren’t present when actually reading an ebook. If you do buy either version with the special offers and down the line you do find them too intrusive or annoying you pay the $20 and get Amazon to remove them. After reading on most of the leading eReaders out there, I can say that the reading experience on the Kindle Paperwhite is second to none. With it’s increased screen resolution and improved contrast rate it’s the closest to reading a physical book you can get at the moment. The integrated light is very well executed and evenly spread across the whole display lighting the screen up in a more natural light. The performance of the device in page turns and normal useful is noticeably quicker that The kindle Touch and other eReaders with a good battery life even with using the light. The only downside is the lack of text-to-speech functionality as mentioned previously, but despite that the Kindle Paperwhite is a great eReader and comes highly recommended.